Once again managing to miss the release date of a Mgła album, although fortunately not by as much as with my review of Groza, it’s a pleasure to once again present this band for the delectation of discerning black metallers. The Polish duo’s second full-length is a natural progression, tightening the band’s sound and enhancing the melodies, resulting in a compelling listen that gives away a little more on each fresh airing. Once again one long song split up into Roman numeral-titled pieces, the band now has shorter track lengths that average about five minutes with one seven and one ten minute piece, expanding the members’ songwriting skills and making a statement much like Altar of Plagues’ on Teethed Glory & Injury – although Mgła hasn’t made anywhere near as big a shift in sound. Opener I sets the scene well, beginning with torrential blastbeats atop a melody that will come to be known as the album continues, an enjoyably epic theme returned to and played with in various forms, growing more grandiose here as the track progresses. The first of many excellent performances comes here from drummer Darkside too, throwing in added interesting bells and whistles atop the usual blackened beating that you’d expect. II continues the epic theme but expands on the blackened sound a little more, a touch of groove giving the song a doom feel but a more deranged vocal performance from M making the song harsher despite that. It takes a few listens to hear it, but II is actually something of a ‘single’, being quite infectious and allowing the melody to drive the song – the black metal carapace that covers it is total, however. I’ve seen criticism of the album for toning down the usual black metal sting in favour of melody and even accessibility, and while it definitely has the latter, it’s hardly easy listening. The following III proves this alone with fast-paced blasting that at first cloaks and then enhances the atmospheric effect, building to a gloriously epic charge that is black metal at its finest, a charge that is continued on IV despite a brief shifting of gears back to doom pace, before the band speed right up again. There’s a muffled voiceover ranting in the distance later in the track that has a strangely eerie effect, and despite a slightly dull V, VI and VII ramp the quality back up, the latter returning to the epic territory of earlier in the album, albeit taking longer to build up with even more of a pay-off. As a whole, is this a better album than Groza? I’m genuinely unsure; not because it’s a step down in obvious quality, but because it’s different, and deserves to be judged in its own right. 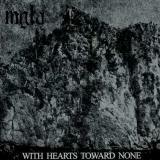 It’s a step forward for Mgła, but in some ways a step backwards too, as continuing along the path started here will leave black metal behind even further and dilute the band’s appeal. The third album will be make-or-break; for the moment, With Hearts Towards None is an excellent listen that goes a long way towards paying off the hype thrown around after Groza. Fans of Groza will love this, as indeed will black metallers that love traditional yet distinct takes on the genre.